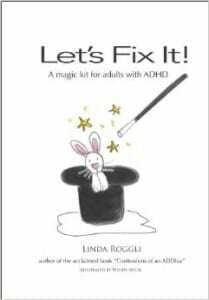 Let's Fix It, Magic Kit for Adults with ADHD - ADHD Women: Born to be Extraordinary! Presto! Chango! Your ADHD is fixed! Is there really a magic formula to “fix” adult Attention Deficit Hyperactivity Disorder? Sadly, no. But this skinny little book packs a huge amount of ADHD information between its covers: ADHD medication explained, alternative ADHD treatments, finding a great ADHD professional and there is a chapter full of ADHD tips, tricks and resources. It’s an easy-to-read summary of everything ADHD for adults; a great gift for friends and family who don’t “get” your ADHD. Good reference when you visit your doctor, too.